Mitch Rotolo Jr. shows off his tossing skills. Photo courtesy Rotolo's. A pizza a day keeps the doctor away. Okay, maybe that’s not how the saying goes, but we can probably all agree that we wish it went at least a little something like that. For Mitch Rotolo Jr. of Rotolo’s Craft & Crust, focusing on pizza seems to be working out pretty well for him. 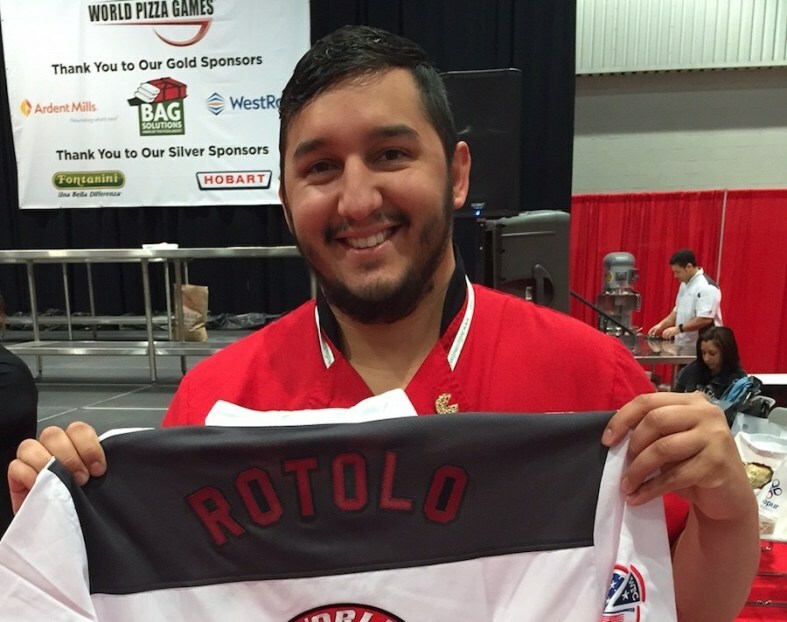 This year Rotolo was named the 2019 Young Entrepreneur of the Year by Pizza Today and the International Pizza Expo, the largest pizza show in the world. When pizzeria owners under the age of 40 were summoned by the Pizza Today and Pizza Expo teams to be considered for the award, Rotolo impressed them enough to be one of the top three who received an expenses-paid trip to the Pizza Expo. There, he gave a talk about his company and business philosophies where the audience voted on the spot for him to receive the award. “It feels amazing to be recognized by a number of successful colleagues in my field,” says Rotolo. Rotolo celebrates his World Pizza Games victory. Photo courtesy Rotolo's. In addition to receiving the 2019 Young Entrepreneur award, Rotolo won two gold medals, one for the “Fastest Dough” and another for the “Pizza Triathlon,” during Pizza Expo’s World Pizza Games. At this two-day Olympics-style competition, pizza specialists from all over the world competed in a number of pizza-related games. Rotolo held his own to come out on top, but he doesn’t let his victories go to his head. “It has given me a sense of humbleness in my work and drives me to inspire my staff and the people around me,” says Rotolo. Among all the chaos involved in the games, Rotolo notes that it is a great feeling to have represented his brand well in a crowd of skilled competitors. Following these accomplishments, Rotolo’s Craft & Crust has a bright future ahead of it. “You’re going to be seeing a lot more of the brand in areas we haven’t made a presence in yet,” says Rotolo. With these awards comes an abundance of confidence for the brand, and the team at Rotolo’s Craft & Crust is eager to show their customers what they can do. “We look forward to showcasing what our brand is and giving new customers the uniqueness and quality they deserve,” adds Rotolo. Try Rotolos Craft & Crust at its location on Ben Hur Road, which is open Monday through Friday from 11 a.m. to 11 p.m., and Saturday and Sunday from 10 a.m. to 11 p.m. For the menu and more information, visit rotolos.com/craftandcrust.